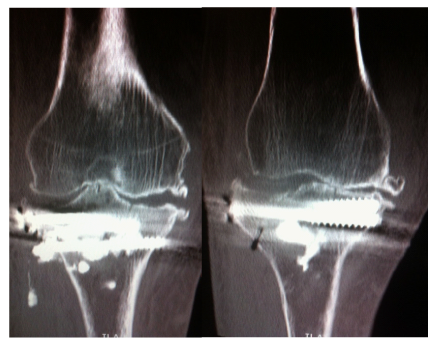 The reduction of depressed tibial plateau fractures is still demanding and often results in joint incogruencies. Current reduction techniques use metallic instrumentation introduced through a tibial bone window, in order to elevate the plateau with manual force which often leads to further fragmentation of the plateau and even articular penetration. We treated our patient who presented with a depression fracture of her right lateral tibial plateau using a novel, minimally invasive technique consisting of an inflatable bone tamp for the reduction of the depression. The technique has the advantages of minimal surgical trauma and widespread reduction force, resulting in a more congruent articular surface. The operation was completed with calcium phosphate cement augmentation of the bone defect and screw fixation of the plateau fracture. No complications were observed during or after surgery. This technique may prove to be a better alternative to standard reduction techniques for depressed tibial plateau fractures, especially for older osteoporotic patients. Depressed tibial plateau fractures can be difficult to treat and current reduction techniques often lead to poor results. The commonly encountered fracture patterns are split with depression and pure lateral depression fractures (Schatzker type II and III), the later seen predominantly in older patient with osteoporotic bone . The treatment of choice for this type of fractures is considered to be open reduction and internal fixation . Elevation of the depressed fragment is necessary in order to restore articular congruency. Nevertheless the use of standard reduction techniques involves opening a bone window in the tibia and reducing the depression using a metal tamp and manual force . However this may result in worsening the defect and even articular penetration as the surface of the impact is small and the force applied is uneven. Borrowing from the successful vertebral kyphoplasty technique, we used an inflatable balloon as a tamp, to reduce a depressed tibial plateau fracture. This gave us the advantage of reducing the bone window to a drill hole while simultaneously increasing the area of force transmission, resulting in easy and satisfactory fracture reduction and minimal trauma. A 91-year-old woman sustained a right lateral tibial plateau depression fracture due to minor trauma (fall while walking). At presentation, the patient had significant knee effusion and was unable to weight bear on the injured leg. Nevertheless, her initial X-rays did not reveal anything more than severe arthritis of her knee. The subsequent CT scan - ordered because of high clinical suspicion - revealed a depression fracture of her lateral tibial plateau without cleavage (Figure 1). Apart from the tibial fracture, the patient had significant comorbidities including six fractured ribs, haemothorax and mild pneumothorax resulting from the same injury as well as cardiac arrhythmia (treated with a pacemaker), severe osteoporosis and adhesive intestinal obstruction. 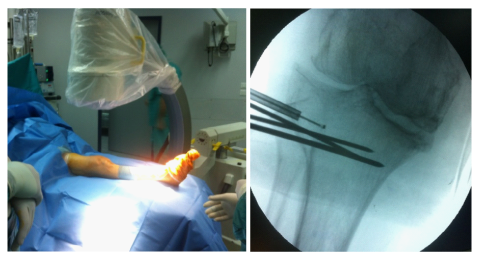 In order to achieve early mobilization of the patient and minimal knee stiffness, surgical treatment was chosen using a minimally invasive technique: Reduction of the depressed tibial plateau using balloon tibioplasty and stabilization of the fracture with hydroxyapatite cement and cannulated screws. The optimal position for balloon placement was predetermined using the CT scanning. In the operating room the patient was placed in supine position on the operating table and a fluoroscopic unit was readily available. Under spinal anesthesia, a clinical stability test was applied, which did not reveal any ligamentous injury. After skin preparation and draping, a trocar was introduced in the lateral tibial plateau through a stub incision and advanced to the predetermined position - below the depressed fragment - using fluoroscopic control. Three Kirschner wires were placed just below the trocar, to act as a palisade, supporting the subsequent balloon inflation (Figure 2). We started slowly inflating the balloon with contrast solution to an initial pressure of 50 psi, without any radiographic evidence of balloon asymmetry, indicative of malpositioning. We then fully inflated the balloon to approximately 250psi, effectively raising the depressed tibial plateau (Figure 3). Figure 1: Clinical presentation, X-ray and CT scan. The contrast medium allowed for continuous monitoring of the reduction process under fluoroscopy in multiple views. When adequate reduction was achieved, two more K-wires were placed just above the inflated balloon to support the reduction and prevent any secondary loss of correction. The balloon was then deflated and withdrawn and two cannulated screws with washers were placed over the K-wires through small stub incisions. One more cannulated screw with a washer was placed below the balloon position and the K-wires were also withdrawn (Figure 4). We then injected calcium phosphate cement through the trocar, filling the balloon-created cavity of the lateral tibial plateau and augmenting the fracture. The volume of the cement was determined by the volume of the contrast solution used with the balloon and the injection was carefully done under fluoroscopy, to avoid excessive cement overflow into the tibial medullary cavity (Figure 5). The final reduction and osteosynthesis were radiologically verified and the stub incisions were closed. The knee effusion was aspirated - giving roughly 200 cc of blood - and a compressive bandage was applied. The patient was mobilized on the first postoperative day without a brace and was allowed partial weight bearing. Apart from a subsequent knee effusion which required another aspiration and intra-articular steroid injection on the second post-operative day, no other complications were noted. The patient received rigorous physiotherapy, achieved full range of motion by the second week and progressed to full weight bearing by the end of the third week. Postoperative radiographs and CT scans showed an excellent result without any residual deformity (Figure 6). Furthermore, follow-up radiologic evaluation at one and three months revealed adequate osteointegration of the cement and no loss of correction. The patient is by now, one year post-operative, pain free, mobile and autonomous, and satisfied with the result. Figure 2: Operative room and draping, trocar and supporting K-wires introduction. Figure 3: Balloon inflation and fracture reduction (outlined by the red line). Figure 4: Fracture supporting K-wires, balloon deflation, and screw fixation. Figure 5: Cement injection for fracture augmentation. Figure 6: Post-op CT scan. Tibial plateau fractures with depression are predominantly seen in elderly people and for this reason their treatment must take into account the fragility and osteoporosis of the bones treated . Conventional treatment options call for the use of metallic instruments for the reduction of the depression, which in osteoporotic bone may result in further damage of the articular surface and joint incongruence or even joint penetration. We instead, used a new technique for the reduction, balloon tibioplasty, borrowed from spinal surgery. The technique is already in use apart from kyphoplasty surgery, in maxillofacial surgery , and has recently been used for other areas such as acetabular fractures , cuboid fractures , distal radius , calcaneus , and lately tibial plateau fractures . It has already been proven both in laboratory as well as clinically to be superior to conventional methods, the only drawback being the higher cost due to the disposable instruments [9-11]. In our case, the technique proved to be easily applicable and yielded excellent results. We achieved fast mobilization of the patient with no deterioration of the reduction. 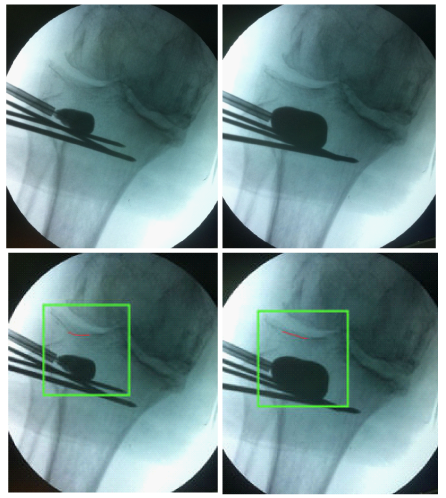 The main advantages of balloon tibioplasty are the minimally invasive nature of the technique and the increased and uniform load distribution during the reduction process, leading to lesser articular trauma and restoration of a better articular surface. We also used calcium phosphate cement to fill the defect - supporting and stabilizing the fracture - the use of which is well documented in the literature [12,13]. 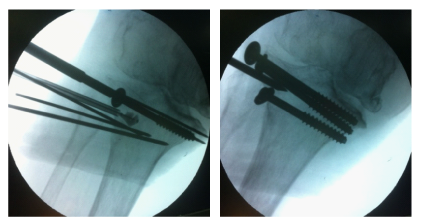 The fracture fixation can be done either with a buttress plate, or with cannulated screws [14,15]. We chose screw fixation because of the fracture pattern and in order to keep the surgical trauma to a minimum. We presented the use of a new technique (balloon tibioplasty) for the reduction of a depressed tibial plateau fracture in an elderly osteoporotic patient. We found the technique to be easily applicable and effective in reducing the depression as well as minimally invasive. We achieved excellent results without any complication during or after the operation. The technique therefore appears to be a promising alternative to standard reduction options for this type of fracture in the elderly, leading to better results and lesser surgical trauma. Schatzker J, Tile M (2005) The Rationale of Operative Fracture Care. Springer Verlag, Berlin, Germany. Moore TM, Patzakis MJ, Harvey JP (1987) Tibial plateau fractures: definition, demographics, treatment rationale, and long-term results of closed traction management or operative reduction. J Orthop Trauma 1(2): 97-119. Marsh JL, Slongo TF, Agel J, Broderick JS, Creevey W, et al. (2007) Fracture and dislocation classificationcompendium-2007: Orthopaedic Trauma Association classification, database and outcomes committee. J Orthop Trauma 21(10 Suppl): S1-S133. Fain J, Peri G, Verge P, Thevonen D (1981) The use of a single fronto-zygomaticosteosynthesis plate and a sinus balloon in the repair of fractures of the lateral middle third of the face. J Maxillofac Surg 9(3): 188-193. Konig B, Khodadadyan C, Schaffler A, Pflugmacher R, Stockle U (2007) Percutaneously navigatedballoon fracture reduction in a displaced acetabular fracture. Unfallchirurg 110(12): 1072-1075. Heim KA, Sullivan C, Parekh SG (2008) Cuboid reduction and fixation usinga kyphoplasty balloon: a case report. Foot Ankle Int 29(11): 1154-1157. Iida K, Sudo A, Ishiguro S (2010) Clinical and radiological results of calcium phosphate cement-assisted balloon osteoplasty for Colles’ fractures in osteoporotic senile female patients. J Orthop Sci 15(2): 204-209. Bano A, Pasku D, Karantanas A, Alpantaki K, Souvatzis X, et al. (2009) Intra-articular calcaneal fracture: closed reduction and balloon-assisted augmentation with calcium phosphate cement: a case report. Cases J 2: 9290. Pizanis A, Garcia P, Pohlemann T, Burkhardt M (2012) Balloon tibioplasty: a useful tool for reduction of tibial plateau depression fractures. J Orthop Trauma 26(7): e88-e93. Broome B, Mauffrey C, Statton J, Voor M, Seligson D (2012) Inflation osteoplasty: in vitro evaluation of a new technique for reducing depressed intra-articular fractures of the tibial plateau and distal radius. J Orthop Traumatol 13(2): 89-95. Werner CM, Scheyerer MJ, Schmitt J, Wanner GA, Simmen HP (2012) Minimally invasive balloon-assisted reduction and internal fixation of tibial plateau fractures. Unfallchirurg 115(12): 1126-1132. Trenholm A, Landry S, McLaughlin K, Deluzio KJ, Leighton J, et al. (2005) Comparative fixation of tibial plateau fractures using alpha-BSM, a calcium phosphatecement, versus cancellous bone graft. J Orthop Trauma 19(10): 698-702. Welch RD, Zhang H, Bronson DG (2003) Experimental tibial plateau fractures augmented with calcium phosphate cement or autologous bone graft. J Bone Joint Surg Am 85-A(2): 222-231. Keating JF, Hajducka CL, Harper J (2003) Minimal internal fixation and calcium-phosphate cement in the treatment of fractures of the tibialplateau. A pilot study. J Bone Joint Surg Br 85(1): 68-73. Koval KJ, Sanders R, Borrelli J, Helfet D, DiPasquale T, et al. (1992) Indirect reduction and percutaneousscrew fixation of displaced tibial plateau fractures. J Orthop Trauma 6(3): 340-346.